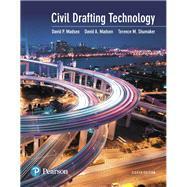 by Madsen, David P.; Madsen, David A., Emeritus; Shumaker, Terence M.
Everything students need to learn about civil drafting in a single volume. This text provides complete coverage of the design and drafting principles and practice used in the civil drafting field, and a working knowledge of the basic topics of mapping–in a workbook format. Created with input from civil engineering industry professionals and educators and content-tested in the classroom, Civil Drafting Technology is a unique, comprehensive guide to civil drafting in a clear workbook approach. Designed with the goal of providing a foundation of work done by civil engineering companies (associated drawings, skills, and terminology) and a broad education in the civil drafting field, the book acquaints students with the civil drafting discipline, mapping, computer-aided design and drafting (CADD), surveying, locations, distances, angles, directions, contour lines, site plans, horizontal alignments, profiles, earthwork, detail drawings, and geographic information system (GIS). Most of the drawings and maps are generated by specialized CADD software, and a variety of data collected using electronic surveying techniques. The book’s 14 chapters each deal with a specific subject area and provide realistic examples, illustrations, review questions, and problems. The new edition is substantially revised with a number of updates and improvements. David P. Madsen is the president of Engineering Drafting & Design, Inc. and the vice president of Madsen Designs Inc. (www.madsendesigns.com). He provides drafting and design consultation and training for all disciplines, he has been a professional design drafter since 1996, and he has extensive experience in a variety of drafting, design, and engineering disciplines. Dave has provided drafting and computer-aided design and drafting instruction to secondary and postsecondary learners since 1999, and has considerable curriculum, and program coordination and development experience. He holds a Master of Science degree in Educational Policy, Foundations, and Administrative Studies with a specialization in Postsecondary, Adult, and Continuing Education; a Bachelor of Science degree in Technology Education; and an Associate of Science degree in General Studies and Drafting Technology. He is the author of Goodheart-Willcox’sInventor and its Applications; Pearson Education’s Autodesk Inventor Basics Through Advanced; and coauthor of Delmar Cengage Learning’s Architectural Drafting and Design, Engineering Drawing and Design, Print Reading for Architecture and Construction Technology, and Print Reading for Engineering and Manufacturing Technology; and Goodheart-Willcox’s Architectural Drafting Using AutoCAD, AutoCAD and Its Applications: Basics and Comprehensive, and Geometric Dimensioning and Tolerancing. David A. Madsen is the president of Madsen Designs Inc. (www.madsendesigns.com), and David Faculty Emeritus of Drafting Technology and the Autodesk Premier Training Center at Clackamas Community College in Oregon City, Oregon. David was an instructor and department Chairperson at Clackamas Community College for nearly 30 years. In addition to community college experience, he was a Drafting Technology instructor at Centennial High School in Gresham, Oregon. He is a former member of the American Design and Drafting Association (ADDA) Board of Directors, and was honored by the ADDA with Director Emeritus status at the annual conference in 2005. David has extensive experience in mechanical drafting, architectural design and drafting, and building construction. He holds a Master of Education degree in Vocational Administration and a Bachelor of Science degree in Industrial Education. David is coauthor of Delmar Cengage Learning’s Architectural Drafting and Design, Engineering Drawing and Design, Print Reading for Architecture and Construction Technology, and Print Reading for Engineering and Manufacturing Technology; and Goodheart-Willcox’s Architectural AutoCAD, Architectural Desktop and its Applications, Architectural Drafting Using AutoCAD, AutoCAD and Its Applications: Basics, Advanced, and Comprehensive, AutoCAD Architecture and Its Applications, AutoCAD Essentials, and Geometric Dimensioning and Tolerancing. Terence M. Shumaker is Faculty Emeritus and former department Chairperson of Drafting Technology, and the former Director of the Autodesk Premier Training Center at Clackamas Community College in Oregon City, Oregon. He was a community college instructor for over 28 years, worked as a training consultant for Autodesk, Inc., and conducted CAD program development workshops around the United States. Terence has experience in surveying, civil and industrial pipe drafting, and technical illustration and is author of Goodheart-Willcox’s Process Pipe Drafting and coauthor of Goodheart-Willcox’s AutoCAD and Its Applications: Basics, Advanced, and Comprehensive, and AutoCAD Essentials.